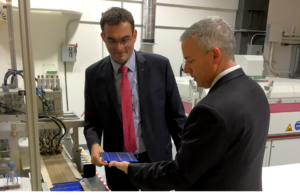 MA State Representative Tom Golden took a tour of Fraunhofer CSE’s labs with Executive Director Dr. Christian Hoepfner on November 15, 2016. Massachusetts State Representative Tom Golden, Chairman of the Joint Committee on Telecommunications, Utilities and Energy, visited Fraunhofer CSE’s office on November 15. Fraunhofer CSE develops, tests, and demonstrates sustainable energy systems, including solar photovoltaic system prototypes. 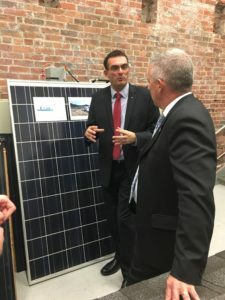 On a tour of the labs with the Center’s Executive Director Dr. Christian Hoepfner, Tom Golden learned about Fraunhofer CSE’s research in solar photovoltaics, grid integration, building energy technologies and building enclosures. Tom Golden is currently serving as State Representative for the 16th Middlesex District, which includes Lowell and Chelmsford. Throughout his career at the State House Tom Golden has served on various committees such as Banks and Banking, Revenue, Healthcare, Energy, Public Safety and Chair of the House Committee on Bills in the Third Reading.